The tongue is rather like a road map of what is going on in your body, it holds information about both your physical and emotional health. Let’s look at it in a little bit more detail. Anatomy – The tongue is a muscular organ covered in soft, pink tissue, the mucosa. 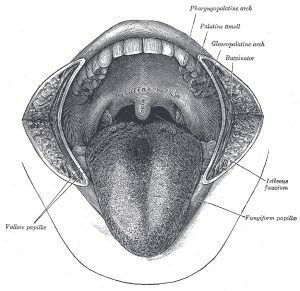 Tiny bumps on the surface of the tongue are papillae, where several thousand taste buds reside which detect sweet, salty, sour and bitter tastes. In Traditional Chinese Medicine (TCM) different parts of the tongue correspond to different internal organs. For example, the tip of the tongue – the heart and lungs; the middle part -the spleen and stomach; the root – the kidneys; both sides of the tongue – liver and gallbladder. In acupuncture and TCM practitioners pay particular attention to the tongue when assessing and diagnosing a patient. The tongue is a very sensitive organ containing water, electrolytes, mucus, and enzymes. Its appearance changes with many physical changes in the body. Which is why the tongue is such a great diagnostic device. Reading the tongue – Tongues have been read in Traditional Chinese Medicine for over a thousand years. And practitioners continue to look at the colour, coating and shape of the tongue when making a diagnosis. Colour – the tongue is an extension of the heart and is said to represent the health of the blood, organs and QI. A pale tongue can indicate low energy and chronic fatigue. The deeper in colour the tongue the more heat, indicating inflammation and possibly infection. A healthy tongue should be pale red. Shape – reflects the state of blood & QI and indicates any deficiencies or excesses. Ideally a healthy tongue is full with no cracks. Cracks – evidence of these could be a sign of long term yin deficiency. Coating – indicates the state of the organs, in particularly the stomach. A think white coating is considered normal and healthy. Whereas a thick yellow coating at the back-centre of the tongue in women in particularly, could be a sign of a dampness in the bladder or lower jiao (pelvic cavity area). Features – where red dots appear it could be a sign of internal heat. Thickness – indicates how much yang or damp is in the system this may present as sluggish digestion and lethary. Next time your acupuncturist asks you to stick your tongue out, you now know that they are looking at your entire body’s route finder map and not just having a bit of fun with you. Have a look at our interactive post to find out which tongue belongs to you. If you would like to find out more about tongue analysis and acupuncture our practitioners would be happy to help. Pease contact us for a free 30 minute consultation.